Science Outreach - Athabasca promotes "hands-on" community participation in the Athabasca area and beyond. We continue to organize and be involved in many successful science-orientated projects. For more information on these and upcoming Science Outreach events, contact Linda, Science Outreach Coordinator for Science Outreach - Athabasca at 675-6653. If possible events may be recorded and posted for those unable to attend. January 9, 2019 - Healthy Eating Environments - Make the Healthy Choice the Easy Choice with Katelynn Skoreiko, Regional Dietitian, Athabasca Community Health Services for Athabasca & Smoky Lake presentation on Nutrition at 7 PM in Athabasca University Governing Council Chambers. Free Community Event! Door prizes! February 14, 2019 - Love under the Northern Lights with Martin Connors Professor, Space Science/Physics from Athabasca University’s Centre for Science at 7 PM in Athabasca University Governing Council Chambers. If the weather permits and the sky is clear, Martin may bring a telescope to view the stars outside. Please dress appropriately for the weather. Free Community Event! Door prizes! February 14, 2019 - AU Science Lab tour for Colinton 4H group with Robert Holmberg and Linda of mammal display. March 27, 2019 - Modeling for real-world systems - Why do we develop models? with Junye Wang, Professor and Campus Alberta Innovates Program Research Chair in Computational Sustainability and Environmental Analytics, Faculty of Science and Technology, Athabasca University at 7 PM in Athabasca University Governing Council Chambers. What would be the impact of agricultural and industrial production in Athabasca River Basin? Is there an optimal way to manage environmental impacts of agricultural and industrial production? We will discuss the differences between the real world and the model world and how to balance the need for detail that approximates the reality of the process and system under study. Free Community Event! Door prizes! April 3, 2019 - Chemistry in the AU Science Lab for grade 9 students from Edwin Parr Composite School with Dietmar Kennepohl, Rafael Hakobyan and Carmen Allen. April 9 & 10, 2019 - Science Fair at Landing Trail Intermediate School in Athabasca for students grades 4 to grade 6 with several judges from Science Outreach - Athabasca. January 24, 2018 - Spider Talks with Dr. Robert Holmberg at Whispering Hills Primary School in Athabasca for 5 classes of grade 2 students. February 8, 2018 - Beavers in our Landscape: Ecosystem engineers or agricultural pests? Topics will include ecology, management options, challenges, beavers and ecosystems. This presentation will be followed by a round table discussion with representatives from Athabasca County, Alberta Trappers Association and Cows and Fish. FREE workshop from 6:30 PM to 9:30 PM with Lisa Card, leading the conversation will be Cows and Fish and the Alberta Riparian Habitat Management Society. In order to attend, please register in advance by contacting Roxanne at 780-675-2273 or info@athabascacounty.com. Location has now been changed to the Athabasca Regional Multiplex. February 22, 2018 – Ancient Landscapes and Prehistoric Human Activity in Alberta’s Oil Sands with Brian Ronaghan, former director of Alberta’s Archaeological Survey, and Robin Woywitka, Archaeological Survey regional archaeologist, will present the key elements of this remarkable story of ancient landscapes and human use—a story that may never have been uncovered were it not for oil sands development and provincial conservation requirements at 7 PM in Athabasca University Governing Council Chambers. Free event! February 23, 2018 – From Indigenous Apple Orchards to the Cultural Mechanics of Trojan Asteroids from 2 to 4 PM with Dr. Martin Connors for FHSS Research Talks. February 28, 2018 - Aurora talk for Athabasca Rotary with Dr. Martin Connors. March 1, 2018 – DNA Extraction with Carmen Allen at Edwin Parr Composite School. April 10 & 11, 2018 – Science Fair at Landing Trail Intermediate School judging by volunteer members of Science Outreach - Athabasca. To see videos click here for the Tesla Coil and here for the Hover Craft. May 1 & 2, 2018 – Spider talks for Athabasca Playschool with Dr. Robert Holmberg at Whispering Hills Primary School. June 24, 2018 - Bio Blitz with many team members of Science Outreach and Nature Kids! Athabasca River Front Park from 1 to 4 PM! Come and explore with us! Learn about the plants and animals that live in your backyard. Please dress for the weather! If you have any questions or would like details, please contact Zoe MacDougall, Nature Kids Program Coordinator with Nature Alberta by email at naturekids@naturealberta.ca or Telephone: (780) 427-8124. June 27, 2018 - Permaculture in Action with Robin Smith Mandel and family. Come for a tour of the River Myst Ranch and bring a potluck dish to share. Please bring your own plates, cutlery and beverage holder in order to reduce waste. This event will be held near Caslan (approximately 76 km from Athabasca). Carpooling is encouraged! With recent rainfall, roads are rutted so low vehicles may have difficulty. Tour will be from 4 PM to 5 PM (potluck to follow). Please contact Robin to register and to receive directions at rivermystranch@gmail.com or call / text 780-327-9927. August 10, 2018 - Mushroom Event at Camp Wright with Dr. Roland Treu. Join us on Friday, August 10, 2018 for a Mushroom Exhibit at Camp Wright, Narrow Lake. This is a great opportunity to learn about local edible and poisonous fungi and their identification. We will meet at 1 PM outside the Camp Wright, Narrow Lake in the Mess Hall. After the exhibit, we will have a walk around the Camp Wright area to look for more mushrooms. You may also bring your own mushrooms for identification. Families with kids are encouraged to attend. Bring appropriate footwear for the walk and be prepared for adverse weather. For directions to Camp Wright click here or download a map. This event is in cooperation with the Long and Narrow Lake Stewardship Society (LNLSS) at Camp Wright, Narrow Lake. August 10, 11 & 12, 2018 - Adventures in Photography For more information, fees, how to apply and to how to register contact The Rotary Club of Athabasca. The Rotary Club of Athabasca, together with Athabasca University and Science Outreach-Athabasca, are excited to offer a redesigned Adventures in Photography program in 2018. The redesigned program includes: more nature and smart phone photography, in addition to night sky photography, a summer schedule during the Perseids meteor shower, the most popular meteor shower of the year, and will also benefit from optimum light conditions with the new moon on August 11. September 15, 2018 - National Star Party at Athabasca University and AUGO with Dr. Martin Connors. Save the date! Please join Athabasca University for an evening of art and stars. On Saturday September 15, the Royal Astronomical Society of Canada is coordinating multiple night sky activities across Canada and Athabasca University is hosting an evening its own evening Star Party from 6 PM to 11 PM. Contact Chris McLeod (Director, Communications & Community Relations) for more details at 780-421-2531 or cmcleod@athabascau.ca. See AU's Facebook page here. September 26, 2018 - The Role of the Human Microbiome in Health and Disease with Dr. Shauna Zenteno, PhD. Associate Professor, Biology, Faculty of Science and Technology & Associate Dean of Graduate Studies, Athabasca University at 7 PM in Athabasca University Governing Council Chambers. Free event! Door prizes! View the Adobe Connect recording here. October 24, 2018 - W(h)et your whistle: what is water and why is it so cool? A bit about water and watershed studies in northern Alberta with Scott Ketcheson, Assistant Professor/ Faculty of Science and Technology at Athabasca University & NSERC Canada Research Chair in Hydrological Sustainability at 7 PM in Athabasca University Governing Council Chambers. Free event! Door prizes! View the Adobe Connect recording here. November 21, 2018 - Managing fish and fisheries in the Athabasca watershed: A regional perspective on a Province-wide approach with speaker Marcel Macullo, Senior Fisheries Biologist, Alberta Government at 7 PM in Athabasca University Governing Council Chambers. Free Community Event! Door prizes! View the Adobe Connect recording here. December 27, 2018 – Athabasca Christmas Bird Count at Muskeg Creek Chalet (56 Street and 49 Avenue), near Landing Trail School. Meet at 8:30 AM. Count is from 9 AM to 4 PM (or until you need to leave). Everyone welcome. January 19, 2017 - Investigating Ancient Civilizations: Maya Archaeology in Belize with Meaghan Peuramäki-Brown, Ph.D., Assistant Professor, Anthropology Program, Athabasca University at Athabasca University Governing Council Chambers from 7 to 8:30 PM. February 9, 2017 - Snapshots of New Orleans with Robert Holmberg a Lunch Time presentation from 12:05 PM to 12:55 PM in Athabasca University Governing Council Chambers. Bring your own lunch. March 15, 2017 - We are not alone: Bacteria in and on our bodies - The Human Microbiomewith Treena Swanston from MacEwan University at 7 PM in Athabasca University Governing Council Chambers. April 4, 2017 - The Art, History and Chemistry of Beer with AU Professor Dietmar Kennepohl at 7 PM in Athabasca University Governing Council Chambers. To attend please register with sc-outreach.coord@athabascau.ca or sign in upon entry. CANCELLED - Northern Viticulture and Climate Change Due to a medical emergency we have cancelled this presentation and will substitute "Circumpolar Bears" with Albert Karvonen. April 13, 2017 - Circumpolar Bears with Albert Karvonen at 7 PM in Athabasca University Governing Council Chambers. April 22, 2017 -Watching the Night Sky in Lac la Biche, AB with Ian Schofield from AUGO2 Athabasca University Geophysical Observatory II at Lakeland Dark Sky Preserve Designation Ceremony & Community Event starting at 2 PM in the Bold Centre. May 4, 2017 - Spider Talks for 2 classes at Athabasca Playschool in Whispering Hills Primary School with Dr. Robert Holmberg. May 10, 2017 - Athabasca River Basin: from glacier to delta presentation at Alberta Student Services Conference in Athabasca from 1:15 PM to 2:15 PM with Dr. Robert Holmberg. May 10, 2017 - Underwater Hawaii presentation at Alberta Student Services Conference in Athabasca from 4 PM to 5 PM with Dr. Robert Holmberg. May 10, 2017 - The Chemistry of Chocolate presentation at Alberta Student Services Conference in Athabasca from 4 PM to 5 PM with AU Professor Dietmar Kennepohl. May 27, 2017 - A Nature Walk to the Secret Pond at Amisk Lake with Albert and Pirkko Karvonen. Registration is limited. Pre-register by May 23... Contact Linda at sc-outreach.coord@athabascau.ca Meet at 10 AM at the gate. For directions, see the Karvonen 2 site for the nature walk. Bring your own water and a snack. Dress for the weather!! This will be about a 7 km walk. June 3, 2017 - A Nature Walk to the Along the Lakeshore at Amisk Lake ending at the Leppanen cabin with Albert and Pirkko Karvonen. Registration is limited. Pre-register by May 30... Contact Linda contact Linda at sc-outreach.coord@athabascau.ca. Meet at 10 AM at the gate. For directions, see the Karvonen 2 site for the nature walk. Bring your own water and a snack. Dress for the weather! This will be about a 3 km walk. June 27, 2017 - Canadian Voyageur Brigade in Whitecourt, AB. Meet entomologist Robert Holmberg at a booth from 5 PM to 8 PM at the Rotary Park on behalf of the Athabasca Watershed Council and Science Outreach - Athabasca. July 15, 2017 - Athabasca Butterfly Count with Robert Holmberg and Wayne Brehaut from 12:30 PM to 4 PM or whenever you need to leave at Muskeg Creek Chalet (56 Street and 49 Avenue, near Landing Trail Intermediate School in Athabasca). Bring your own water and a snack. Dress for the weather! July 19 & 20, 2017 - Lego Robotics Camp with Athabasca Regional Multiplex Summer Programs from 10 AM to 3 PM. To register and a direct link to the brochure click here. Help from many volunteers for Science Outreach - Athabasca and Athabasca University! July 29, 2017 - Mushroom Hunt at Narrow Lake with Dr. Roland Treu. Meet in the Mess Hall at 11 AM at Camp Wright, Narrow Lake to hunt mushrooms. After the walk, we will have a "show and tell" to cover the basics of mushroom identification. If you are unable to attend the walk, bring your own mushrooms at 2 PM for identification to the Mess Hall at Camp Wright. Families with kids are encouraged to attend. Be prepared for adverse weather. For directions to Camp Wright click here and a map. July 29, 2017 - Dark Sky Preserves at 7 PM with Roland Dechesne, Calgary Centre of the Royal Astronomical Society of Canada welcomed by the Long and Narrow Lakes Stewardship Society (LNLSS) at Camp Wright, Narrow Lake. For directions to Camp Wright click here and a map. For more information contact Juanita Marois at (780) 675-1913 or juanitamarois@mcsnet.ca. July 29, 2017 - What's up in the sky? at 10 PM with Roland Dechesne, Calgary Centre of the Royal Astronomical Society of Canada welcomed by the Long and Narrow Lakes Stewardship Society (LNLSS) at Camp Wright, Narrow Lake. For directions to Camp Wright click here and a map. For more information contact Juanita Marois at (780) 675-1913 or juanitamarois@mcsnet.ca. August 8, 2017 - Making Photographs: Thoughts before you press the button from noon to about 1 PM in the Maple Room, next to the Science Lab at Athabasca University (1 University Drive, Athabasca, AB) with Robert Holmberg. Bring your lunch. August 23, 2017 - Two Canadian Photographers: William Notman and Yousuf Karsh from noon to about 1 PM in the Maple Room, next to the Science Lab at Athabasca University (1 University Drive, Athabasca, AB) with Robert Holmberg. Bring your lunch. October 5, 2017 – StarLab for Flying High at Landing Trail Intermediate School 5502 48 Ave, Athabasca, AB with Alberta Parks and Ian Schofield from Athabasca University's Geophysical Observatory from 9 AM to 3 PM. October 5, 2017 - Biting Flies: Vampires of the North with Dr. Robert Holmberg, Professor Emeritus, Athabasca University at 7 PM to 8 PM at The Kings University (Room L116), 9125 50 Street, Edmonton, Alberta. Most likely, every human that has ever lived has had some blood pilfered by a biting fly. There are five families of biting flies in Alberta: mosquitoes, horse flies, black flies, no-see-ums, and certain muscid flies. We will cover their diversity, habits, life cycles, medical and veterinary importance, and how to avoid being bitten. Preserved specimens will be available for viewing. Everyone welcome! October 11, 2017 - Biting Flies: Vampires of the North with Dr. Robert Holmberg, Professor Emeritus, Athabasca University from 7:00 PM to 8:30 PM at Athabasca University, Governing Council Chambers. Most likely, every human that has ever lived has had some blood pilfered by a biting fly. There are five families of biting flies in Alberta: mosquitoes, horse flies, black flies, no-see-ums, and certain muscid flies. We will cover their diversity, habits, life cycles, medical and veterinary importance, and how to avoid being bitten. Preserved specimens will be available for viewing. Door Prizes and refreshments available! Free family event! November 15, 2017 – The Ape in You: What it means to be 2% human with Dr. Hugh Notman, Associate Dean, Learning Technologies, and Associate Professor, Biological Anthropology in the Faculty of Humanities and Social Science at 7 PM in Athabasca University Governing Council Chambers. Have you ever wondered why watching monkeys and apes at the zoo can feel like looking into a mirror? Are we really just naked, two-legged apes? Perhaps – especially given the oft-cited statistic that we share 98% of our genes with the chimpanzees. But does that mean all of our unique “human-ness” can be captured in the other 2%? In this discussion, we will explore some of the facts and misconceptions concerning our place in the primate family tree; where our shared traits with the nonhuman primates might come from, and what the “two-percent” differences might really mean. Free event! Door prizes! November 22, 2017 - Spider Talks with Dr. Robert Holmberg at Athabasca Hutterite School for students ages 6 to 14. December 27, 2017 – 2017 Athabasca Christmas Bird Count at Muskeg Creek Chalet (56 Street and 49 Avenue), near Landing Trail School. Meet at 8:15 AM. Count is from 8:30 AM to 4 PM (or until you need to leave). Everyone welcome - rank amateur to expert! A great family event. For information contact Wayne Brehaut wbrehaut@mcsnet.ca or Harvey Scott at 780-675-4158. January 28, 2016 - Spider Talks at Boyle School with Robert Holmberg. February 24, 2016 - DNA Extraction at Edwin Parr Composite School with Carmen Allen. March 9, 2016 - Spider Talks at Vilna School with Robert Holmberg. March 9, 2016 - Unwanted Guest: bedbugs, lice and fleas school presentation at Vilna School with Robert Holmberg. March 15, 2016 - A History of Lake Management in Alberta and the Lakes of Athabasca County with David Trew from the North Saskatchewan Watershed Alliance at Athabasca University Governing Council Chambers from 7 to 8:30 PM. April 23, 2016 - Junior Forest Warden Association Conference in Sherwood Park talk on Spiders, Scorpions, Mites and Other Things Nice with Robert Holmberg. April 27, 2016 - Spider Talks at Vilna School with Robert Holmberg. On display from May to October 14, 2016 - Photography Exhibit at Athabasca University at Athabasca University. Feel free to view this self-directed display at Athabasca University between the Library and Science Lab. May 11, 2016 - Spider Talks at Rochester School with Robert Holmberg. May 11, 2016 - Bedbugs, Lice and Fleas Presentation at Rochester School with Robert Holmberg. May 17, 2016 - Spider Talks at Athabasca Playschool with Robert Holmberg. May 18, 2016 - Spider Talks at Athabasca Playschool with Robert Holmberg. May 18, 2016 - DNA Forensics Lab for Landing Trail grade 6 students in the AU Science Lab with Carmen Allen. May 24, 2016 - Rocks and Minerals Lab for Landing Trail grade 7 students in the AU Science Lab withwith Ken Munyikwa. June 3, 2016 - Spiders and Their Kin presentations for 5 classes at Whispering Hills Primary School grade 2 students with Robert Holmberg. July 23, 2016 - Athabasca Butterfly Count with Robert Holmberg and Wayne Brehaut from 12:30 PM to 4 PM or whenever you need to leave at Muskeg Creek Chalet. August 13, 2016 at 9 PM - Bat Walk with Lisa Card, Highway 2 Conservation near Rochester/ Perryvale. Weather permitting and will be decided the day of the event. Contact Science Outreach to register by Thursday, August 11 at sc-outreach.coord@athabascau.ca with the number of people attending, names including your email and you will be contacted at 6:30 PM (the day of the event) by email if this event will go ahead that day which will be dependent on the weather . Maximum 20 people. Meet at Perryvale Country Store at 9 PM and car pooling will be arranged to the site. August 20, 2016 at 9 PM - Bat Count with Lisa Card, Highway 2 Conservation near Amisk Lake. Weather permitting and will be decided the day of the event. Please register by August 15 at sc-outreach.coord@athabascau.ca with the number of people attending, names including your email and you will be contacted at 6:30 PM (the day of the event) by email if this event will go ahead that day which will be dependent on the weather. Maximum 20 people. September 2, 3 & 4, 2016 - Photography and Night Sky Adult workshop with Robert Holmberg and Bromley Chamberlain. This event has been CANCELLED due to low registrations. Please watch for this event in the future. September 30 to October 2, 2016 - Night Sky and Photography for Rotary Youth Adventures Program Register with Mavis Jacobs at 780-675-7118, mavisj@telus.net or Andrew Woudstra at 780-213-0064, Rotary Club of Athabasca. In cooperation with Athabasca Rotary, Athabasca University and Science Outreach - Athabasca. with Robert Holmberg, Professor Emeritus of Biology at Athabasca University. Free and open to all interested parties. How do I prevent getting bed bugs when I travel? This presentation will cover the identification, prevention and control of three groups of human ecto-parasites: bed bugs, lice and various fleas. October 19, 2016 - Bats Benefiting Albertans with Lisa Card, Highway 2 Conservation (H2C) at Athabasca University Governing Council Chambers from 7 PM to 8:30 PM. To view this presentation click here and to access the link to H2C's website and the link to the Alberta Community Bat program. October 21, 2016 - Wonderous World of Spiders with Robert Holmberg at the Institute of Astronomy, University of Hawaii, Honolulu. November 17, 2016 - Bones and Stones Event - 10,000 years in Athabasca: Artifacts and archaeology in north central Alberta with Todd Kristensen, Regional Archaeologist, Historic Resources Management Branch, Alberta Culture and Tourism at Athabasca University Governing Council Chambers from 7 to 8:30 PM. Feel free to bring in artifacts and fossils for identification! There will be a presentation and demonstration on how stone tools were made. November 21, 2016 - Spider talks with Robert Holmberg for 6 classes of grade 2 students at Whispering Hills Primary School. January 20, 2015 - Muskeg Creek Trail Through the Seasons with Dr. Roland Treu in Athabasca University Governing Council Chambers from 7 to 8 PM. Please click on this link for a map of the Muskeg Creek Trails. February 12, 2015 - Presentation for Girl Guides/ Animal Tracking on the Muskeg Creek Trail with Dr. Roland Treu at 2 PM. February 24, 2015 - Presentation on Underwater Hawaii with Dr. Robert Holmberg in Athabasca University Governing Council Chambers from 7 to 8:30 PM. Refreshments generously sponsored by The Bistro. April 21, 2015 - The Athabasca River Basin Watershed Blues with Wayne Brehaut in Athabasca University Governing Council Chambers from 7 to 8:15 PM. April 22, 2015 - DNA Foresensics Lab with grade 6 students from Landing Trail School run by Carmen Allen from 9:30 AM to 2:30 PM. View Athabasca Advocate article here. April 22, 2015 - Tour of AUGO with grade 6 students from Landing Trail School run by Ian Schofield. April 29, 2015 - Spider Talks at 1:30 PM with Robert Holmberg for playschool students at Whispering Hills Primary School. April 30, 2015 - Spider Talks at 9:30 AM with Robert Holmberg for playschool students at Whispering Hills Primary School. April 30, 2015 - Spider Talks at 1:30 PM with Robert Holmberg for playschool students at Whispering Hills Primary School. May 9, 2015 - Nature Walk with Beavers, Cubs and Scouts at Narrow Lake with Robert Holmberg. May 12, 2015 - Citizen Scientists Play an Important Role in Bird Conservation with Brenda Dale, Wildlife Biologist from Canadian Wildlife Service. Partnership with Crooked Creek Conservancy Society of Athabasca in Athabasca University Governing Council Chambers from 7 to 8 PM. Click here for Citizen Science Checklist. May 19, 2015 - Nature Walk with Students from Caslan School (Kindergarten to Grade 8) at Conservancy Land near Amisk Lake with Albert Karvonen. May 21, 2015 - The Forest is Calling with Albert and Pirkko Karvonen at Buffalo Lake Métis Settlement Community Centre at 7 PM. See media package and more information here. For a copy of this DVD contact Albert or Pirkko Karvonen at pakarvonen@gmail.com and mail $30 to Box 454 Boyle, AB T0A 0M0. May 23, 2015 - Athabasca Watershed Annual General Meeting. Contact Wayne Brehaut for more information at wbrehaut@athabascau.ca or Jim Sellers at (780) 392-1210 or email jsellers@athabascau.ca (Project Coordinator, ARBRI/ Research). June 17, 2015 - Presentation on Underwater Hawaii with Dr. Robert Holmberg in the Maple Room from noon to 1:15 PM. Bring your own lunch. This is a repeat presentation similar to the one held for the public on February 24 for Science Outreach - Athabasca. This session is for the Ecology students and anyone else wishing to attend. July 11, 2015 - Athabasca Butterfly Count with Robert Holmberg and Wayne Brehaut. Meet at at Muskeg Creek Chalet from 12:30 to 4 PM. A great family event! See news article here. July 30, 2015 - Presentation on Survey of Arthropods with Dr. Robert Holmberg in the Maple Room from noon to 1:15 PM. This session is for the Introductory Biology students and anyone else wishing to attend. July 14, 2015 - New Horizons at Pluto and Star Party with Martin Connors, Professor, Space Science and Ian Schofield, Observatory Researcher at Athabasca University in Athabasca University Governing Council Chambers at 8 PM and AUGO. Come and learn about the New Horizons Mission to Pluto and visit the university observatory (AUGO) for hands-on observations with telescopes. August 13, 20 and 27, 2015 - Mushroom Identification Sessions with Dr. Roland Treu Bring your mushrooms for identification into the Science Lab at Athabasca University. September 11 to 13, 2015 - Night Sky and Photography for Rotary Youth Adventures Program Register with Mavis Jacobs at 780-675-7118, mavisj@telus.net or Andrew Woudstra at 780-213-0064, Rotary Club of Athabasca. In cooperation with Athabasca Rotary, Athabasca University and Science Outreach - Athabasca. September 13, 2015 -The Forest is Calling Calgary Finlandia Cultural Association at the Calgary Scandinavian Centre, Valhalla Room (739 - 20 Ave. NW) at 5 PM. Free Admisiion. Discussion with the Karvonens to Follow. Coffee, tea and snacks will br provided by CFCA. October 8, 2015 – Spider Talks at Boyle School with Robert Holmberg and Linda Lindballe. 4 presentations will be held for students in kindergarten and grades 1 to 3. October 14, 2015 - Speaker on Native bees: a look at the natural history and ecology of Alberta’s endemic pollinators with Dr. Jessamyn Manson from U of A in cooperation with CCCSA in Athabasca University Governing Council Chambers from 7 to 8:30 PM. November 4, 2015 - Presentation on Capturing the Light: Adventures in Photography & the Night Skywith Robert Holmberg and Bromley Chamberlain for Athabasca Rotary at noon. November 5, 2015 - Presentation on Arachnids of Albertawith Robert Holmberg for Edmonton Natural History Society (Bug & Spider group) at Kings University College from 7:30 PM to 9 PM. November 18, 2015 - Speaker Jana Tondu on Winter Water Quality in the Athabasca River: From Jasper to Lake Athabasca in Athabasca University Governing Council Chambers from 7 to 8:30 PM. November 23, 2015 - Presentation on The Origin of ARBRI with Robert Holmberg in Edmonton for ARBRI Days. November 23, 2015 - DNA Extraction with Carmen Allen at Edwin Parr Composite School. November 23 & 24, 2015 - ARBRI Days in Edmonton at Coast Edmonton Plaza Hotel in Edmonton from 8:30 AM to 4:30 PM each day. November 25, 2015 - DNA Extraction with Carmen Allen at Edwin Parr Composite School. January 17, 2014 - A Night at the Observatory for Sparks, Brownies and Girl Guides of Athabasca with Ian Schofield. February 27, 2014 - Invisible Domains: The world under a microscope presentation with Roland Treu in Athabasca University Governing Council Chambers at 7 pm - 8:30 pm. March 26, 2014 - Pharmaceuticals and Personal Care Products in the Aquatic Environment with Lawton Shaw in Athabasca University Governing Council Chambers at 7 pm - 8:30 pm. Postponed - Unmanned Aviation Vehicles (UAVs) presentation with Frederique Pivot in Athabasca University Governing Council Chambers at 7 pm - 8:30 pm. April 17, 2014 - Mosses and Muskeg Matter - More than you Might Imagine with Dr. Kelman Wieder from Villanova University in Athabasca University Governing Council Chambers at 7 pm - 8:30 pm. View PowerPoint presentation. April 25, 2014 - Mineral Identification workshop with grade 7 students from Landing Trail School at Athabasca University. May 3, 2014 - Athabasca University Science and Technology Research and Educational Showcase at Telus World of Science from 10 AM to 4 PM. May 9, 2014 - Obliteration by Synthetic Peptides: A Possible Approach Against Pesky Biofilm Infections in Athabasca University Governing Council Chambers at NOON to 1 PM. May 12, 2014 - Spider Talks for Athabasca Playschool with Robert Holmberg at Whispering Hills Primary School. Morning and afternoon sessions. May 15, 2014 - Spider Talks for Tawatinaw Valley Playschool with Robert Holmberg in Rochester. May 15, 2014 - Spider Talks for Rochester school with Robert Holmberg for kindergarten to grade 9 students. Morning and afternoon sessions. May 20, 2014 - Spider Talks for Athabasca Playschool with Robert Holmberg at Whispering Hills Primary School. Morning and afternoon sessions. May 24, 2014 - Plant, Animal and Fungi Identification nature walk and workshop for Beavers, Cubs and Scouts with Robert Holmberg at the Long Lake Junior Forest Warden Camp run at Narrow Lake. June 9, 2014 - Ecuador: from rain forests to deserts in the Maple Room at Athabasca University from noon to 1 PM. June 11, 2014 - The Wondrous World of Sharks and Rays in the Maple Room at Athabasca University from noon to 1 PM. June 18, 2014 - Ecuador: from rain forests to deserts in the Maple Room at Athabasca University from noon to 1 PM. June 19, 2014 - Athabasca River Basin: from glacier to delta in the Maple Room at Athabasca University from noon to 1 PM. July 5, 2014 - Athabasca Butterfly Count at Muskeg Creek with Wayne Brehaut and Robert Holmberg from 12:30 to 4 PM. 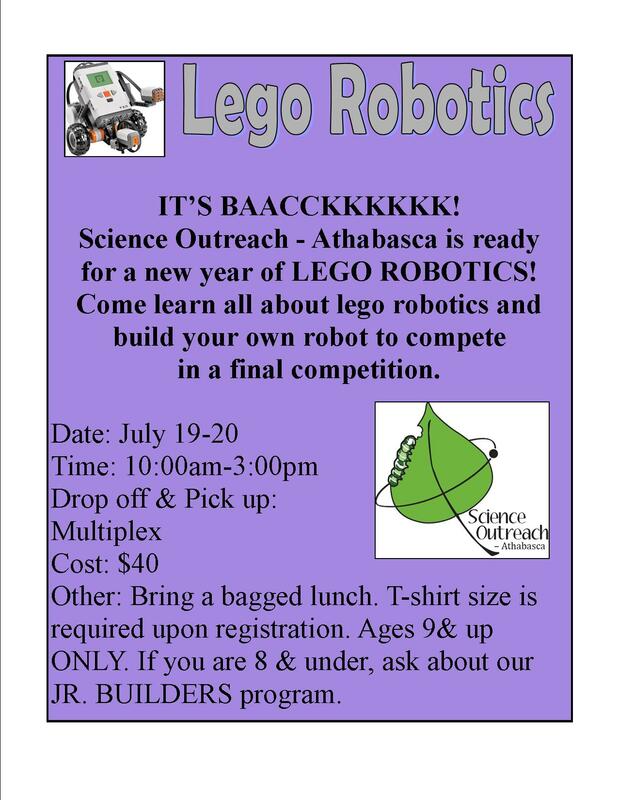 August 13 & 14, 2014 - Lego Robotics Camp with Athabasca Summer Programs led by Dr. Lisa Carter from 10 AM to 2 PM. August 15, 2014 - Flying Robotics Camp with Athabasca Summer Programs led by Dr. Frederique Pivot from 10 AM to 3 PM. September 5 to 7, 2014 - Photography and Night Sky Adult Session (see details here) held at Athabasca University, Athabasca University Geophysical Observatory and Athabasca University GeoSpace Observatory. To register contact Robert Holmberg at robert@athabascau.ca or 780-675-6596. September 19 to 21, 2014 - Adventures in Photography and the Night Sky with Rotary Adventures Program, AUGO Obervatory and Science Outreach - Athabasca. Please contact Mavis Jacobs with Athabasca Rotary to register. September 25, 2014 - COSIA Sustainability Resources Ltd (Canada's Oild Sands Innovation Alliance) Fundamentals of Environmental Monitoring FREE WORKSHOPS in Athabasca. Click here for more information. September 26, 2014 - COSIA Sustainability Resources Ltd (Canada's Oild Sands Innovation Alliance) Fundamentals of Environmental Monitoring FREE WORKSHOPS in Edmonton. Click here for more information. October 16, 2014 - COSIA Sustainability Resources Ltd (Canada's Oild Sands Innovation Alliance) Fundamentals of Environmental Monitoring FREE WORKSHOPS in Fort McMurray. Click here for more information. October 25, 2014 - Introduction to Geocaching with Colin Elliott in Athabasca University Governing Council Chambers and Muskeg Creek Trails from 2 to 3:30 PM. October 28, 2014 - Introduction to Geocaching with Colin Elliott at Athabasca Outreach School from 1 to 3 PM. November 13, 2014 - Spider Talks for 5 classes of Grade 2 students at Whispering Hills Primary School with Dr. Robert Holmberg. November 27, 2014 - Municipal Drinking Water Treatment in the Athabasca Region - Understanding the Process with Jamie Giberson in Athabasca University Governing Council Chambers from 7 to 8 PM. Click here to view the PowerPoint for this presentation. December 27, 2014 - 2014 Christmas Bird Count with Crooked Creek Conservancy Society of Athabasca at Muskeg Creek Chalet. Contact Harvey Scott at 780-675-4158. January 16, 2013 - Family Film Night with the Karvonens (Featuring 2 films with retired filmmaker Albert Karvonen) in Governing Council Chambers at Athabasca University at 7 PM. February 26, 2013 - The Origin of the House Cat with speaker Richard Loken, Senior Systems Administrator at Athabasca University Governing Council Chambers from 7 PM to 8:30 PM. Admission is free. Richard will discuss the 10,000 year history of the domestic cat and its relationships with humans, house mice and its Wildcat relatives. April 24, 2013 - DVD Presentation: White Water, Black Gold - A Nation's Water in Peril in Athabasca University Governing Council Chambers at 7 pm - 8:30 pm. May 15, 2013 - The Set-Up and Maintenance of Freshwater Aquariums with Crystal Scherer in Athabasca University Governing Council Chambers at 7 pm - 8:30 pm. May 30, 2013 - World of Mollusks: Snails, Clams and Squids with Robert Holmberg in Athabasca University Governing Council Chambers at 7 pm - 8:30 pm. July 13, 2013 - 2013 Athabasca Butterfly Count with Robert Holmberg, Wayne Brehaut and Jon Leggo at the Muskeg Creek Chalet from 12:30 to 4 PM. September 19, 2013 - Hunting Dinosaurs in Western Canada Presentation with Paleontologist Dr. Phillip Currie from the University of Alberta at Landing Trail Intermediate School at 1:30 PM & 2:15 PM. October 3, 2013 - The Eyes Have it: A Look at Human Vision A Wellness Presentation in Athabasca University Governing Council Chambers with Robert Holmberg at 12 - 1 pm. November 6, 2013 - WATER: Featuring Fish Hunters: Pelicans and Cormorants and Interviews about the Tar Sands with Albert Karvonen in Athabasca University Governing Council Chambers at 7 pm - 8:30 pm. November 28, 2013 - Spider Talks to Thorhild school students Kindergarten to Grade 3. December 6, 2013 - Photography and Composition presentation to Edwin Parr Composite school students Grade 10 and 11. December 27, 2013 - Christmas Bird Count held in Athabasca and the surrounding area. June, 8, 2012 - Convocation at Athabasca University. Visit our Science Outreach display. July 14, 2012 - Athabasca Butterfly Count at Muskeg Creek Chalet. August 21 & 22 - LEGO ROBOTICS CAMP to register contact the Multiplex 780-675-2967. August 23 & 24 - UAV FLYING ROBOTICS CAMP to register contact the Multiplex at 780-675-2967. October 3, 2012 - Stories Fish Tell Us: Tales from the Ear Bone with Dr. Heidi Swanson, Postdoctoral Fellow, Department of Biological Sciences, University of Alberta in Governing Council Chambers at Athabasca University at 7 PM. October 9, 2012 - “Athabasca River Basin presentation Caring for our Watersheds” at Edwin Parr Composite School” Athabasca River Basin presentation "Caring for our Watersheds" with Paula Evans to grade 8 students and staff from Edwin Parr Composite School. November 14, 2012 - Making Pohotgraphs: things to think about before you press the button in Governing Council Chambers at Athabasca University at noon. November 22, 2012 - Photography: F8 and Be There with Jim Cochrane, retired photographer, Edmonton Journal and Canadian Military in Governing Council Chambers at Athabasca University at 7 PM. July 16, 2011 - Annual Butterfly Count at Muskeg Creek Chalet. Everyone Welcome! Christmas Bird Count 2011 - At Muskeg Creek Chalet from 8:30 AM to 4:30 PM (or until you need to leave). See poster. March 5, 2010 - "Athabasca Watershed Forum presentation on Science Bibliography of the Athabasca River Basin"
May 4 & 5, 2010 - "Spider talks to three classes of pre-kindergarten students from Whispering Hills Primary School"
June 20, 2009 - A Nature Walk: "Edible and Medicinal Plants and Mushrooms"
Athabasca River Basin Conference: Water for Life, Water for Strife? Science Outreach - Athabasca: What are we all about?